LexLin Gives Back is a three-part blog series that tells the story of LexLin’s Gypsy Gift donation campaign through the eyes of the children of LexLin Gypsy Ranch owners Eric and Mechelle Barton. The following blog is written by Lindie Barton, the middle child of two girls and three boys. In this first blog, Lindie shares her perspective on the impact LexLin’s Gypsy Gift program has made on countless lives across the country. The second blog will be written by Lexi and will be published on our website Sept. 1st, and the three-part blog series will conclude with a final blog written by Cody, which will be published Oct. 1st. From all of us at LexLin Gypsy Ranch, we hope that you enjoy this unique perspective from LexLin’s next generation. A 10-year-old Lindie Barton poses for a photo with LexLin’s Lindie’s Promise in 2010. My name is Lindie Barton, the 16-year-old daughter of LexLin Gypsy Ranch owners Eric and Mechelle Barton. Over the last six years, the most formative years of my young adult life, I believe – I have witnessed my parents’ ever-growing desire to do something big for society. One of their biggest charitable missions eventually became LexLin’s beloved Gypsy Gift program. This emotionally-riddled, yet awe-inspiring program has taught me some very important lessons in life. One in particular that has stuck with me over the years is that helping others is a priceless, precious gift. 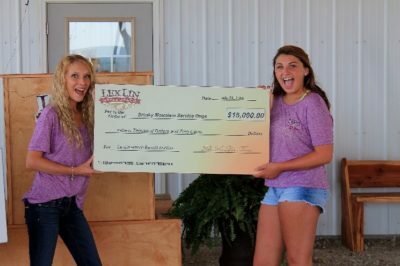 This blog, LexLin Gives Back, begins a three-part series on the evolution of the LexLin Gypsy Gift program, why LexLin gives back, its charitable mission and the positive response we have seen from this wonderful program and how the horses have positively changed lives. I hope that you enjoy my take on the LexLin Gypsy Gift program. Lexi and Lindie playing at the LexLin Ranch in Rockwood, TN. 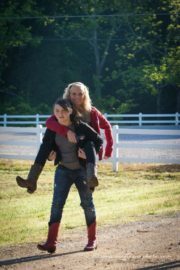 My Mom and Dad created Rockwood, TN-based LexLin Gypsy Ranch in 2009 as a family business with the motto of “living the dream.” The ranch was named after my sister Lexi and I; and ultimately for LexLin and its owners, living the dream means giving back to the community. LexLin has donated 45 horses within the past 3 years: 6 being donated in 2013, 17 in 2014, 10 in 2015 and 11 more in 2016. Their goal was to donate at least 30 horses by the end of a three-year period from 2014-2016. Our family has exceeded that goal by putting tons of time and dedication into LexLin and its multiple charitable programs such as LexLin Gives Back – Honoring Our Heroes Event, Honoring Our Heroes’ successor LexLin Gypsy Gift Program and donations to veteran-based Smoky Mountain Service Dogs and other nonprofit organizations. The LexLin Gives Back – Honoring Our Heroes Event was LexLin’s first charitable program dedicated to giving back to its community. It was a great program based on giving back to our veterans by donating a Gypsy Vanner to a veteran who has served at least 1 year in Iraq or Afghanistan. In 2011, LexLin held its first annual LexLin Gives Back – Honoring Our Heroes Contest. The winner of this contest was Chris Kelly, a veteran of California who won LexLin’s Braveheart. In 2012, LexLin held its second annual contest, which was won by firefighter Jason Warrenfeltz, who won LexLin’s Swade. The third and last annual contest for LexLin Gives Back – Honoring Our Heroes Event was held in 2013 and for the first time, fans and customers of LexLin chose the horse and its recipient. The horse donated for that final year was Stormy, a black and white tobiano Gypsy Vanner who won the hearts of many and was selected for the program. During the voting stages, two applicants quickly rose to the forefront of the voting phase. One applicant was an outstanding individual whose support was well organized by a family member and the other was the Equest Hooves for Heroes program in Texas. My parents quickly realized that the customers and fans of LexLin know best who could really use a Gypsy Vanner horse for therapeutic purposes. LexLin’s Gypsy Gift program was born. Lexi and Lindie Barton goof off during the 2014 horse auction to benefit Smoky Mountain Service Dogs. 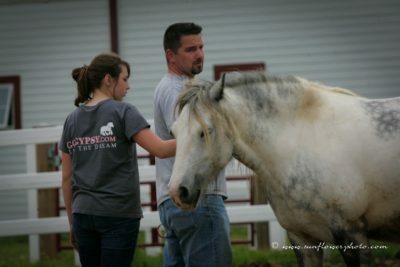 From Honoring Our Heroes came LexLin’s Gypsy Gift Program, which is a program to raise, train and donate LexLin Gypsy Horses for future careers in Equine Assisted Activities and Therapies (EAAT) for nonprofit centers accredited through PATH International. Through these PATH International Premier Accredited therapy centers, LexLin’s Gypsy Vanners work with military veterans and law enforcement suffering from PTSD, amputees, at-risk youth, autistic children, disabled adults, abused women and even families suffering the loss of a young child. Lindie and Eric Barton spend quality father-daughter time together on the ranch. These horses have touched the lives of many. I am always touched to hear about how these horses have made an impact in so many people’s lives. 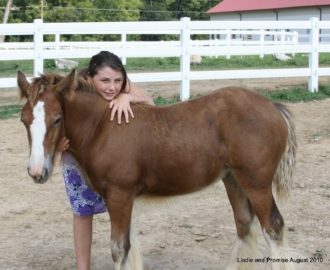 Little Lyric, a Gypsy Vanner donated in 2015, has helped several in grief counseling who had lost their young child. LexLin Gypsy Ranch, hailed as the largest independent Gypsy Vanner operation in North America, is a family business donating 45 horses over a three-year period. The Honoring Our Heroes Event and LexLin’s Gypsy Gift Program were both two huge programs that helped them achieve their goal. These horses impact the lives of the developmentally disabled, sick, injured, troubled and developing lives on a daily basis through these programs. The Barton children: Jon, Cody, Lindie, Lexi and Ben.